Special video footage will be shown on the official website on Aug. 15(Tue.)! MUSIC SHARE, an internet TV station, is celebrating its 5th anniversary. As the 5th anniversary special program, it will showcase “Japan’s first” and “World’s first” on Aug. 15 and 16. This is the “World’s first” attempt to “dissect Bunraku” by “Japan’s first” grassroots music program, MUSIC SHARE. A new creation from a tradition of Japan, which we know very little about! MUSIC SHARE, Japan’s first grassroots music program, started in May 2012 by a music lover and her friends. She then established the association, MUSIC SHARE (address: Setagaya Ward, Tokyo, Representative and Director: Michiyo Ikeuchi). A new stream that focuses on music itself rather than its industry quietly spread nationwide and now has grown to have 10 channels all over the country (5 of which are still under preparation). MUSIC SHARE is supported by “willpower” rather than “capital power”. It’s celebrating the 5th anniversary thanks to the sheer willpower of those who have overcome a number of difficulties they faced along the way. It was recently featured on the TV show by NHK, “Studio Park kara Konnichiwa” and steadily increasing the number of channels and its fans in different parts of the country. Can puppets “come alive” through renewed Joruri? This is the special program that MUSIC SHARE worked on to mark its 5th anniversary. “Ningyo Joruri Bunraku (NPO Bunraku-za)”, a traditional form of Japanese puppet theater, and seven musicians/groups specially selected by MUSIC SHARE will attempt to reconstruct Bunraku for the first time ever. 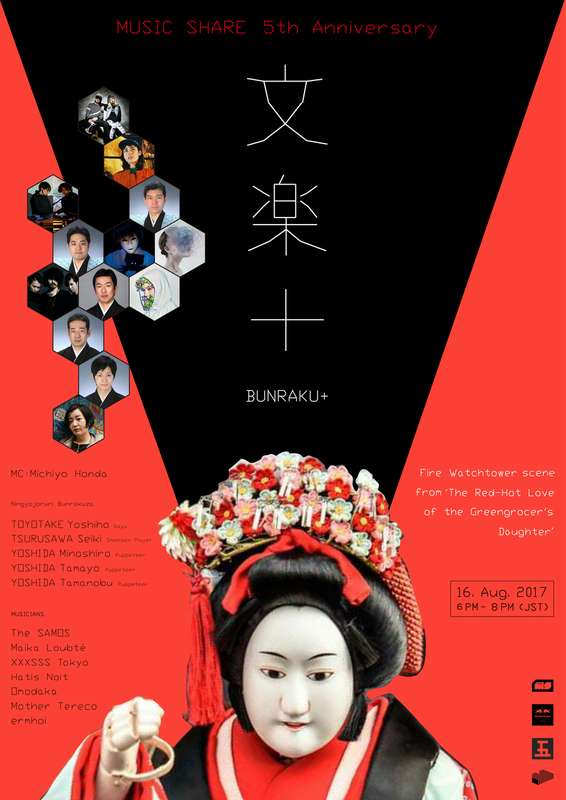 On Aug. 16, Bunraku will be performed by the Bunraku performers along with the music reconstructed and played live by the musicians in the show. And do not miss what we have on Aug. 15. Special footage will be released on the Red Bull official website the day before the live show. On Aug. 15, the day before the show, a documentary of how the seven musicians/groups created music influenced by the original music of the “Fire Watchtower scene” from the Bunraku play called “The Red-Hot Love of the Greengrocer’s Daughter” will be shown on the Red Bull official website. The music produced for this day will be released on the Red Bull Official Website after the live show for a limited time. ◎Ningyo Joruri Bunraku: A traditional art form that was founded around 400 years ago and has been registered on UNESCO’s intangible cultural heritage list. It is a composite performance featuring three distinct art forms in unison. Tayu narrates the story, Shamisen musician plays the music and the puppeteers manipulate the puppets. It cannot be accomplished if any of them is missing. ◎The SAMOS: Led by ShigeoJD of Skebo King (dissolved in 2010) which was a pioneer of mixture sounds in 90s. ◎XXXSSS Tokyo: A collaborative duo by XLII and DJ SARASA that drew a lot of attention. XLII who was born in Ukraine and brought up in NY is well-known worldwide because of her bold performance. DJ SARASA was born in Japan and brought up in NY. ◎Maika Loubté: She attracted public attention when she performed with Underworld who had a worldwide smash hit featured on the soundtrack of “Trainspotting”. The release of its sequel at a large-scale music festival “Super Summer Sound 2017” 20 years after the original movie created a lot of buzz. ◎Omodaka: Otherwise known as Soichi Terada, is a legend who has recently gained recognition again. He is in great demand not only in Japan but also around the world. ◎Hatis Noit: She garners a great deal of attention also overseas as Matomos, known to be an collaborator of Björk, participated in her work. ◎Mother Tereco, ermhoi: They are newcomers but their talent is favorably compared with other musicians. Those impressive seven musicians/groups are on the lineup! They will attempt to reconstruct Bunraku for the first time ever. ■MUSIC SHARE, with a widespread network throughout the country, will continue to broadcast Japan’s top quality music programs under the concept of “proudly introducing Japanese musicians to the world”, with the support from Red Bull Studios Tokyo who shares common goals and values with music programs that MUSIC SHARE is striving to create.